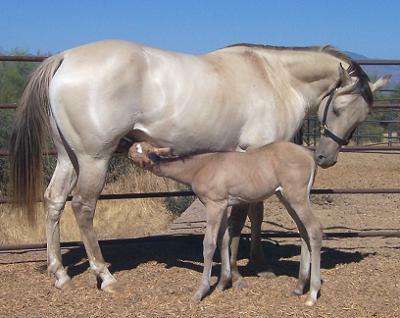 Champagne horses carry at least one copy of the dominant Champagne allele, at the champagne color dilution gene. This causes red pigment to be diluted to a golden color, and black pigment to a brown or taupe color. 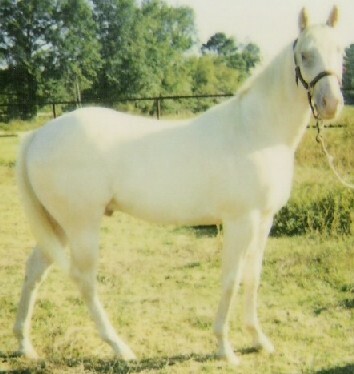 The coats of champagne horses therefore vary in appearance according to their base color and any other color modifiers present. 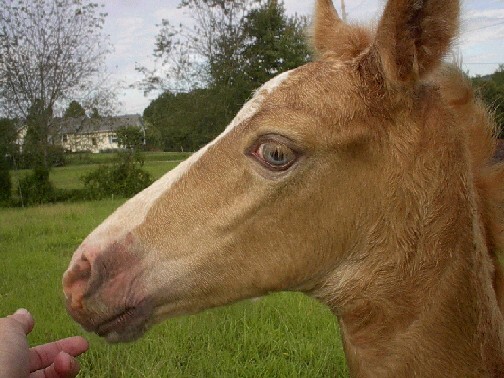 The Champagne allele also affects eye and skin color, including in heterozygous horses. As far as its known there is no difference between heterozygous and homozygous horses, making the gene truly dominant. 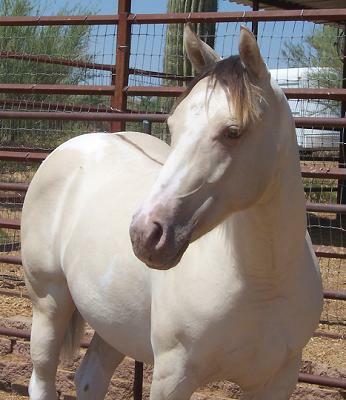 Champagne horses are born with whitish or bright blue eyes which gradually turn hazel or amber as the horse matures. They have pink skin which may darken to a purpley color over time. 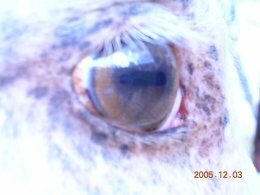 Dark freckles also develop, especially around the muzzle and eyes, under the tail, and on the sheath or udder. Some have reverse (dark) dapples. As with many other colors champagne coats tend darken in the winter. 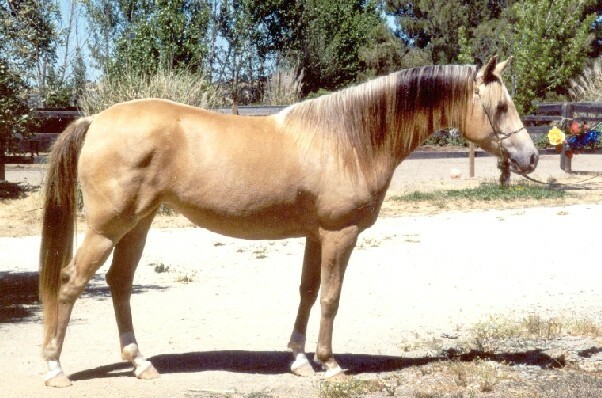 Although champagne horses have undoubtedly been about for a long time they are only recently receiving recognition as being distinct, having often been mis-classified in the past. Before champagne was recognised in its own right (and sometimes now) it was often confused with palomino, buckskin, or even dun, including grulla, (although they do not have primitive marks like duns). Champagne is found particularly in Tennessee Walking Horses, American Saddlebreds, Missouri Foxtrotters and American Quarter horses and ponies. 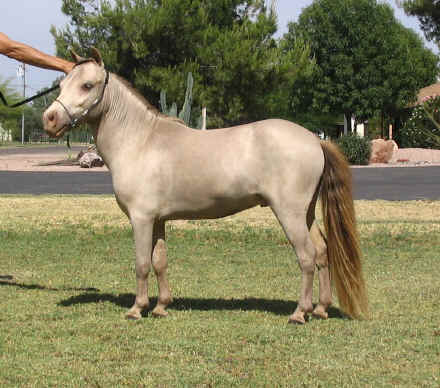 Although champagne horses have undoubtedly been about for a long time they are only recently receiving recognition as being distinct, having often been mis-classified in the past. Before champagne was recognised in its own right (and sometimes now) it was often confused with palomino, buckskin, or even dun, including grulla, (although they do not have primitive marks like duns). Champagne is found particularly in Tennessee Walking Horses, American Saddlebreds, Missouri Foxtrotters and American Quarter horses and ponies. The Champagne gene owes its name to a classic (black) champagne Tennessee Walker mare named Champagne Lady Diane (foaled in 1969). 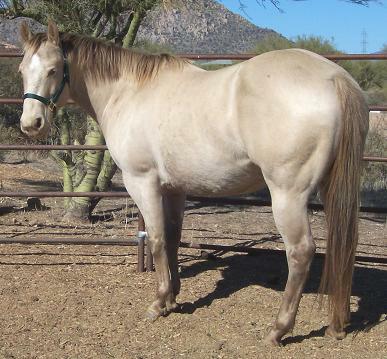 She was named for her color, which reminded her owner of sparkling wine. Samples of Champagne Lady Diane’s hair were sent to the University of Tennessee and Auburn University by her owner Diane Green. She was described by them as “a genetic color accident”, which I presume means they thought her color was due to a new mutation. 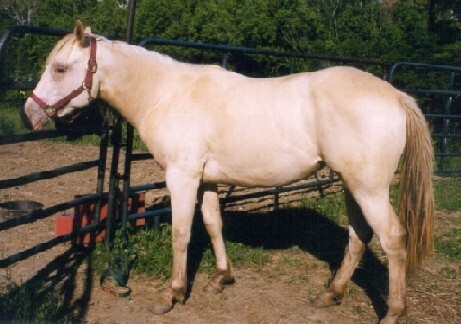 In fact Champagne Lady Diane was not the first champagne horse and probably inherited the Champagne gene from her dam, Mack’s Golden Girl H, who was probably a gold champagne. There is plenty of evidence that the Champagne mutation pre-dates Champagne Lady Diane. One rather quirky piece of evidence is from Johnny Cash’s song of ten years earlier, “The Tennessee Stud”. This refers to a horse who was “color of the sun” with green eyes. 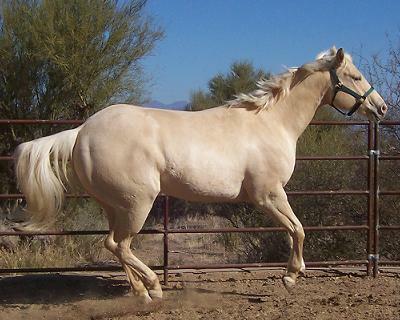 Another is that the American Cream Draft Horse seems to have been started in 1911 with a gold champagne mare called 'Old Granny'. The actual shade of champagne varies with the base color of the coat. Champagnes with a black base coat are classic champagne horses, such as MF Mi Little Prince Charming ("Prince") on the left. Champagne can combine with other dilutions. The pictures show two classic champagnes who are also dun. 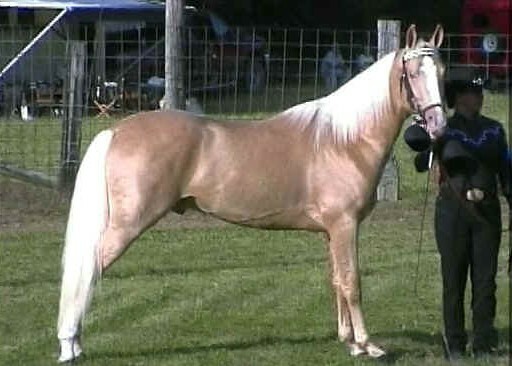 Champagne horses with a chestnut base coat are gold champagne , a color sometimes called wheaten or pink skinned palomino. In combination with palomino champagne makes gold cream, shown below left. 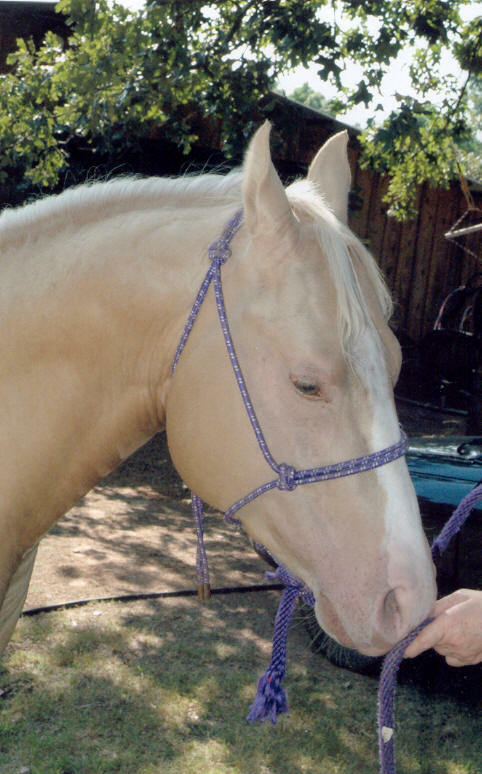 "Ivory" champagne was the name originally used for the combination of chestnut, champagne and cream (gold champagne with a cream gene, or you could say a palomino with a champagne gene!). 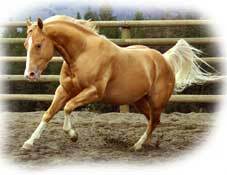 Such horses have an ivory-colored body with a white mane & tail, resembling cremellos but with amber eyes. Gold champagne with dun (gold dun) is shown below right. Horses with a bay base coat are amber champagne (below left) and those with a brown base coat are sable champagne (below right). 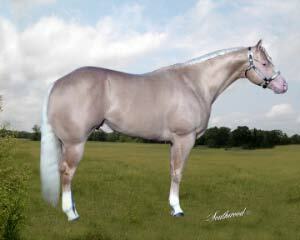 There are also amber and classic champagne horses with cream genes, with a darker body color and points. 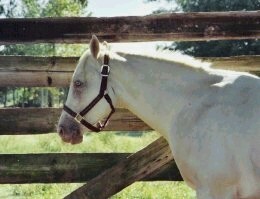 Interestingly I've heard that horses with both champagne and gray genes don't go completely gray. Apparently their coats look white or cream with a metallic sheen, but are covered with champagne-colored fleabites. The pink skin tends to have heavy dark freckling. The mane and tail may be brown-tinted, presumably depending on the base color. I've read that gray and champagne are considered co-dominant. However this suggests that champagne is another allele of the gray gene and I doubt this is the case. 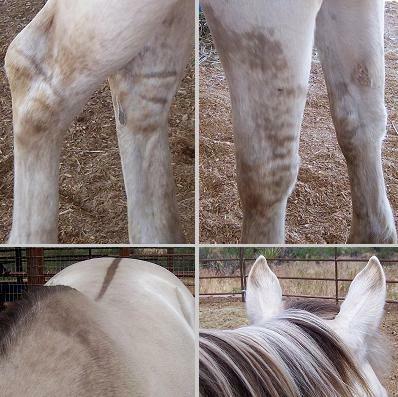 My personal feeling about this is that the horses observed were normal flea-bitten grays. "Flea-bites" are thought to be controlled by a separate and probably recessive gene. 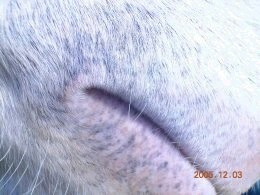 On gray horses they cause speckles in the original coat color, which, if the speckling starts soon enough can become quite large and numerous. 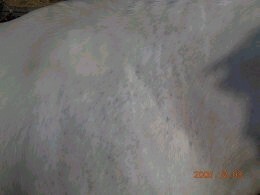 If it is common that horses with both champagne and gray are flea-bitten then it is quite possible that the flea-bite allele is linked to the champagne allele.